Shopping in Spain and Scotland: Fashion Finds From Zara, Sfera, H&M and Arran Aromatics! I won't lie, I'm a leeeeetle bit sad at not being on holiday anymore. I recently spent a week in Spain and then a week in Scotland chilling out with my family and in-laws, and it was just what the doctor ordered. It's always a bit of a struggle getting back into the daily grind but I'm consoling myself with these pretty purchases I picked up on my travels. I could have spent all day in the accessories section at Sfera, another Spanish highstreet brand, but Mr Fluff was having none of it - so I just grabbed these little skull clips (they were only a couple of euro), and one or two little pieces as gifts. The gold flat chain necklace is from H&M; I'd spotted it on the gorgeous Beauty Crush, so I picked that up for about €7. I'm so susceptible! We also spent a day on the island of Arran, just off the west coast of Scotland, which included a wee visit to Arran Aromatics. I'll tell you more about it in a separate post, but while I was there I bought my first candle from the brand - an unusual sounding almond and frankincense - and at the till I chucked in a mini soap in Just Grapefruit. I love this scent - I've enjoyed the handwash and handcream from this range before. What do you make of my Spanish and Scottish buys? Are you familiar with any of the brands? And have you treated yourself to anything lovely of late? Me too K - have to stop myself now or I'll be studded head to toe and look like I forgot to take off my Halloween costume! Totally love all your buys Emma, definitely my kind of thing!!!! Ooh I love your studded picks and totally would have bought the flats and clutch too! Ahh I really want to go to Zara in Spain now too! great purchases, I wish there was Sfera in Ireland! Love the spiked loafers and the gorgeous gold necklace. Love the studded flats...so very tempted to get some..only i'm afraid I'll take the leg off myself with the studs..i have a habit of crossing my ankles!!!!! Those skull clips! I love them! And great finds in Zara! Wow! They are mean looking. 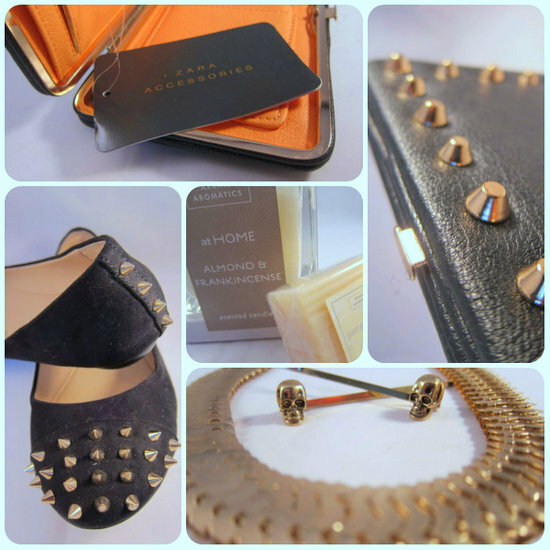 I am so loving these studded shoes and accessories. It's even worth the price they've tagged it with. Gorgeous purchases! I like the flats! Ahhh I think I need some studded flats now! Ooh I love the things you got on holidays Emma. The Zara shoes and clutch were such bargains! Love the studs too. And I loved that chain on Sammi too, H&M have some great jewellery at the moment! Hope you're not missing the holiday feeling too much!